The 18F2550 is the same as the 18F4550 except it is in a 28 pin poackage and has no SSP port but it does have the USB port. The 18F2550 is a microcontroller for more demanding applications having lots of program memory (16k) and RAM (2k) and a full USB interface - V2.0 Compliant (Low Speed (1.5Mb/s) and Full Speed (12Mb/s). You can run the external clock up to 48MHz and if using a lower external clock the internal PLL will run high enough so that the USB clock operates at the correct speed. So this microcontroller can operate at 48MHz! - but remember the internal clock is Fosc/4 so the MIPS rate is 12MIPSi.e. the real operating frequency is 12MHz. It comes in a 28 pin package and is also optimized for C programming (75 standard + 8 extra instrucitons) and it uses nano watt technology. Once again the device uses ICSP for programming and you can program it in circuit if you design the interface correctly. As with all the 18F series there is a built in 8x8 hardware multiplier so your calculations will run much faster. Note: Unlike the mid range PIC micros the 18F series have a 31 word stack so you can make nested function calls without worrying about running out of return stack space. For a summary of each peripheral block click here. 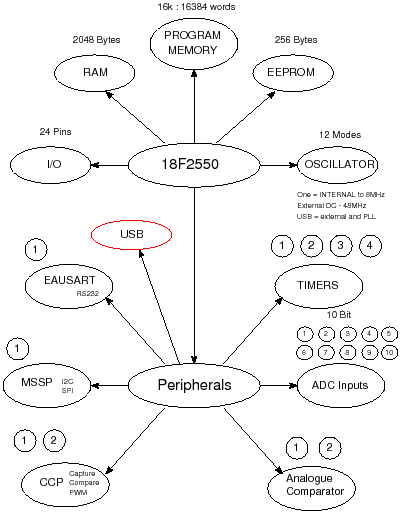 The 18F2550 is a very capable microcontroller that includes a USB interface built-in. In fact this microcontroller is very similar to the Arduino Uno, which uses the Atmega328p,. The only major (functional) difference being that the 18F2550 has a built in USB whereas the 328p does not. The architectures of each device are also not similar (the 328p uses a big instruction set whereas the PIC range uses a RISC instruction set). The PIC devices split the clock into four phases so the actual instruction speed (MIPS) is 1/4 the main clock the speed. The Atmega parts run at the clock speed So it looks like the Atmega should be faster since it can take a 20MHz clock it can run at 20MIPS. However for timing reasons (generating a millisecond clock) the Arduino runs at 16MHz. 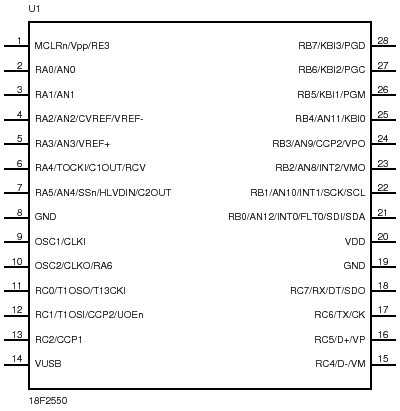 The max clock for the 18F2550 is 48MHz (12 Mhz Xtal upscaled by internal PLL) to 48 so 1/4 of that is 12Mhz or 12MIPS. The other factor that is interesting is that the RISC instruction set means you need to use more instructions to get the same job done compared to Atmega parts - but that is all hidden in the compiler that generates the assembly code. In all the Atmega parts should be faster. However you may want to choose a PIC part as there is a huge range of internal peripherals that can be matched to your application.